The Watch Dude: Introducing the Modify Watches Mini! Introducing the Modify Watches Mini! An upstart watch company called Modify Watches contacted me and offered to send me a free watch. Since free is good, a couple of e-mails led to the arrival of this very cool watch and two interchangeable bands last week. The watch pictured is the Modify Mini. The watch face is an inexpensive, self-contained, unit with a Japanese movement that can easily be removed from the band and placed into another band. The bands are made of a very comfortable velvety rubber and come any many hip colors. If you stretch the band, you can pop the watch face out and put it into another watch. 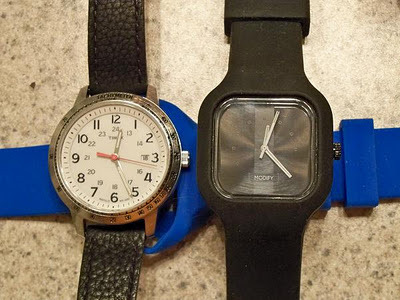 Changing the look of a Modify Watch is much, much, easier than conventional watch bands. The collection comes in two sizes - Mini and Classic. If you check out the Modify Watches website ( Modify Watches ), you might wonder how big the watches are. The Mini is about the size of a regular wrist watch and the Classic is a big watch that would make any hip-hop artist proud. The classic would probably look great with a Flavor Flav style alarm clock around your neck! Indeed, the company describes all of these watches as "Dope!" Here is my Mini pictured with a considerably more uptight Timex Weekender for comparison purposes. The second Modify watch band is underneath the two watches. 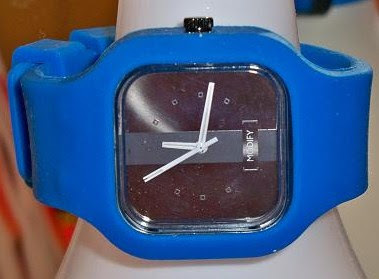 Modify Watches offers a fresh approach to the wrist watch. It would be very easy to develop a collection of expressive interchangeable faces and colorful bands. At this writing, there are 12 Mini Watch faces and 13 band colors. The watch faces start at only $25 and the watch bands start at only $15. These fun watches won't break a tight budget and won't be mugger bait if you are out at night. I really like these watches.The bands are made of a very comfortable velvety rubber and come any many hip colors.